In addition to the "Tormey" family name, it should be noted that there are several similar derivations of the name that share a common heritage. These would include "Tormay", "Torme", "Tormy" and "Tarmey". More historical versions of the name would include the likes of "Tormaigh", "O'Tormaigh", "O'Tormay" and "O'Tormey", as will be expounded upon later in this article. The information contained herein will be of interest to those with any of these surnames. For simplification, however, here on out I will primarily focus on the more common spelling of Tormey when referring to the modern version of the name. As a result of nineteenth and twentieth century migration patterns, Tormeys can be found in many parts of the world today, though larger numbers are primarily located in Great Britain, the United States, Australia and even Argentina. For the most part, we all consider ourselves Irish in origin, due to the fact that we can trace our roots to an ancestor who, at some point, lived in and emigrated from Ireland. Tormeys have, in fact, resided in Ireland for centuries. As a definitive example, the earliest recorded collateral ancestor (*1) with our family name was Giolla-Iosa O'Tormaigh, an archbishop of Ardagh who lived during the thirteenth century -- nearly 800 years ago. While Giolla-Iosa O'Tormaigh may be the first Tormey to show up in printed history books, other less-noteworthy Tormeys likely lived in Ireland as early as the eleventh century and perhaps earlier. That a group of Irish peoples would have descended from Scandinavian Norsemen is entirely consistent with history -- as Norwegian and Danish Vikings, adventurers and traders had a long history of interaction with the Irish from the ninth to the eleventh centuries. Some were plunderers and conquerors. Others were traders. Many remained and made Ireland their permanent home; and many, as would be expected, married Irish women and integrated themselves into Irish/Gaelic culture. At some point, perhaps in the stage between Tormach and Tormaigh (etymologists don't know exactly when), the name evolved from being simply a personal name (first name) to a family surname. (See my notes below in Addendum 1: The Evolution of Surnames.) It was then that Tormeys came to be known by O'Tormaigh -- a patronymical name, in typical Irish fashion, meaning simply "grandson of" or, perhaps more accurately, "descendant of" Tormaigh. One should note that, unlike many other Irish surnames, such as O'Neill or Kelly (O'Caellaigh), the name of O'Tormaigh may not necessarily point back to a single patriarch ancestor. That is to say, all those who bore the name might not have been necessarily related as a single family unit. Rather, it is believed that O'Tormaigh was more descriptive of a group of people who shared a similar heritage (i.e., descendants of Norsemen -- Thor's men -- foreigners of sorts who, although they lived in Ireland, spoke Gaelic and shared Gaelic heritage and values, also valued their Scandinavian past and religious beliefs and likely lived together in groups). In the centuries that followed, as English influence over Ireland increased, the traditional Gaelic spelling of "O'Tormaigh" became more anglicized and evolved into "O'Tormay" and "O'Tormey". Later yet, particularly in the seventeenth century, as English influence gave way to forced (and often violent) subjugation, the name evolved into simply Tormay and Tormey and, to a lesser degree, Torme, Tormy and Tarmey. In some cases, to be sure, the dropping of the "O" would have been a simple case or survival (wanting to avoid English persecution). In other cases, it would have simply been a desire to better "fit in" (i.e., a belief that having a more English sounding name -- or a less Irish sounding name -- would potentially lead to more privilege and prosperity). In any case, for at least the last two centuries, our forebears have been known simply by the surnames of Tormey, Tormay, Tarmey, etc. Referring to the Tormaigh/O'Tormey/Tormey family name, Historian Edward MacLysaght notes that "from the earliest recorded times, it has belonged to County Longford and adjacent parts of Westmeath and Cavan." 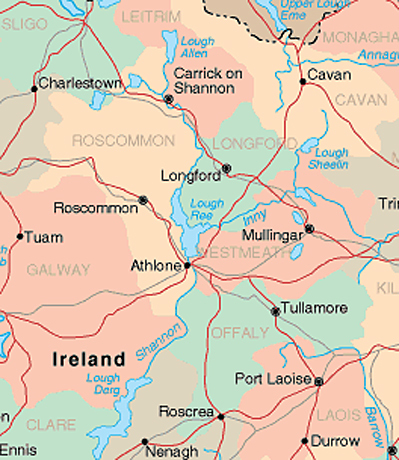 (*3) Numerous other historians also associate the Tormey name with County Longford and the areas of the Irish Midlands surrounding Lough Ree (Lake Ree). This lends credence to the belief that Tormeys are descendants of Scandinavian Norsemen, if one considers the long history of Vikings in the area and, in particular, the history of the town of Longford, reported to have been originally founded by Vikings. It was during the tenth century A.D. that Viking explorers extended their reach deeper into the heartland of Ireland, sailing their longboats up the Shannon River (Ireland's longest river, dividing the west of Ireland from the east and south) to Loch Ree. (See map below.) Of course, often simply raiders and pillagers, early Vikings were seen as a threat to the local population. Gradually, however, many Vikings/Norsemen settled and established themselves as a permanent presence in the area, building towns, building a network of trade and, as one would expect, marrying into Irish families. Ree appears below.) Map source http://www.map-of-ireland.org. Referring to the long and profound presence of Vikings/Norsemen in the Irish Midlands, Fellow Researcher James Tormey Clare wrote in an earlier work that "it is easy to understand why the counties abutting Lough Ree, even today, have the highest concentration of Tormey families or their descendants in all of Ireland." surrounding counties of Longford, Westmeath, Roscommon, Cavan, etc. Of course, one should note that the Irish Midlands weren't the only area with a Viking/Norse presence. Viking settlements and towns existed throughout Ireland. Indeed, to this very day, there are many Irish citizens who have common Scandinavian family names. It is uniquely in the Irish Midlands area, however, particularly around Lough Ree, that a group of Norsemen came to be identified as descendants of Thor's men: O'Tormaighs, O'Tormeys and, ultimately, Tormeys. The Question of a Tormey "clan"
As an interesting aside, when researching the "Tormey family crest", more often than not the actual crest noted for Tormey is indeed that of the O'Reilly clan. Likewise, crests I have seen for Tormey, O'Reilly and O'Ferrel all seem to contain similar elements (in particular, a lion). Of course, the topic of family crests is a controversial one (and one that I will address on this website at a future date). "The first of our line were the Tormach, grandsons of a fierce Norseman who was drowned. They ruled the lake for a hundred years and fought alongside Brian at his fall." "My great uncle James said we were few since 1689 when William's English forced the bulk of the O'Reillys, O'Ferrals [O'Farrells] and O'Tormaighs into the lake (Loch Ree) and hung the survivors; ever after, in any scrap, we were to side with the O'Reillys and O'Ferrels as brothers." "The surname was spelled Tormaigh only when the English eyes are not on ye." Robert Tormey's information supports the belief that our ancestors descended from Scandinavian Norsemen as opposed to some other indigenous Gaelic group. It is interesting to me that Robert Tormey's information specifically mentions "the Tormach". That this knowledge was passed down from generation to generation is particularly significant -- as it has taken etymologists years of research to draw an association between the modern name of Tormey and the historical, Scandinavian name of Tormach. It is particularly interesting that Robert Tormey's information mentions a "fierce Norseman who was drowned". Historical chronicles, tell of a Viking chieftain. by the name of Thorgisl (also referred to as Turgeis, Turgisius or Thorgeis) who, in 831 united a large group of vikings in Ireland. One source, Heimskringala (The Chronicle of the Kings of Norway), notes Thorgisl to be a son of King Harald Harfagra of Norway and refers to him as the ruler of Dublin. 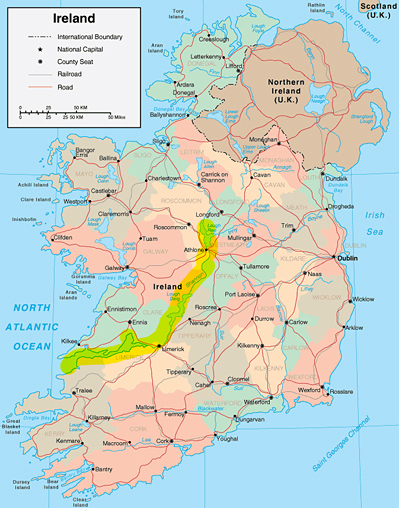 (*10) Over time, he is known to have conquered and ruled most of the northern half of Ireland. His rule was not long lasting, however, as he was ultimately deposed by resurgent Irish factions. In the year 845, Thorgisl was captured by the forces of King Malachai I (Maelsechlain) of the Meath Ui Naill and was drowned in Loch Uair (now Loch Owel, near Mullingar, County Westmeath). (*11) Is it possible that Tormey history dates back to this Thorgisl who died by drowning in 845? Moving ahead 600 years in his account, Robert Tormey states that "we were few since 1689 when William's English forced the bulk of the O'Reillys, O'Ferrals and O'Tormaighs into the lake (Loch Ree) and hung the survivors..."
It is unclear to me what specific battle or skirmish this statement might be referring to, but 1689 was a big year in English and Irish history and was marked with heavy fighting between Catholic and Protestant forces. It was in 1689 that William III, Prince of Orange, a Protestant nephew of Catholic King James II, deposed his uncle and, with the blessings of Parliament, became King of England, Scotland and Ireland in his uncle's stead. James II fled to the largely Catholic Ireland, where he gathered supporting forces and unsuccessfully attempted to defend his claim to the throne by battle. If it is true that our Tormey ancestors were involved in the fight against William III, then it can be supposed that they were fighting in support of the Catholic King James II. One must assume, therefore, that Tormeys (or O'Tormaighs, as they would have been known at the time) identified themselves not only as Irish, but as Roman Catholic as well. It is interesting, too, that Robert Tormey's information makes specific reference to O'Tormaighs fighting alongside O'Ferrals [O'Farrells] and O'Reillys (supporting other references made to the close association between the Tormeys and the two clan groups). The English oppression of Ireland that occurred from the seventeenth century onward was largely a Protestant versus Catholic struggle -- a struggle that has continued, in varying degrees, until modern times. And the statement passed on by Robert Tormey, that "the [Tormey] surname was spelled Tormaigh only when the English eyes are not on ye" would certainly indicate that Tormeys were caught up in this struggle. Interestingly, our ancestors, descendants of pagan Vikings, had over the course of the centuries come to be strongly Catholic and strongly Irish -- sufficiently so to fight in defense of both their faith and their country. (Another chapter on this website, Tormeys of Historical Note in Ireland, makes mention of some specific Tormeys who were, as James Tormey Clare referred to them, "torchbearers of Irish freedom". For the most part, the use of surnames was not an organized process or event, but rather it developed over time, drawing on miscellaneous cultural and lingual influences. Typically, names evolved from four general sources: a man's occupation (i.e., Hunger, Carpenter, Smyth), where he lived or had come from (i.e., Brook, Field, Overhill), his father's name (i.e., Robertson, Johnson, Jackson), or from a personal characteristic or physical feature (i.e., Redman, Longfellow, Lytle). (*1) A collateral ancestor is an ancestor who is not in the direct line of ascent, but who is of the same ancestral family. For example, while a father is a direct line ancestor of a son or daughter, an uncle is a collateral ancestor (non-direct line ancestor) of a nephew or niece. That is to say, he is related, but he is not a direct link to a grandparent or a great-grandparent. (*2) Woulfe, Patrick, Irish Names and Surnames (Slointe Gaedel Is Gail) (Genealogical Publishing Co., 1993), pages 158, 653. (*4) The Historical Research Center, Inc., Deerfield Beach, Florida, 1993. (*6) The Book of Irish Families (Irish Genealogical Foundation, Kansas City, Missouri, 1992), page 257. (*8) MacLysaght, Edward, Supplement to Irish Families (Helicon, Ltd., 1964), page 148. (*9) O'Laughlin, Michael C., The Master Book of Irish Surnames: Locations, Ethnic Origins, Variant Spellings & Sources (Irish Genealogical Foundation, Kansas City, Missouri, 1993). (*10) Sturluson, Snorri, Heimskringla (The Chronicle of the Kings of Norway), c. 1179-1241. (*11) The War of the Gaedhil with the Gaill (The Invasions of Ireland by the Danes and other Norsemen), an original Irish text translated into English by James Henthorn Todd, D.D., M.R.I.A., F.S.A. (London, 1867), pages xliii, 227. (*12) Pendergast, John P., The Cromwellian Settlement of Ireland (1870), page 162.